Find latest FreshCo Flyer Toronto Valid Aug 10 - 16, 2017. Where can i buy the cheapest Produce, Bakery, Fresh from Ontario Farms, Grocery every day? Earn more FreshCo flyer, deals this week for getting quality item fresh fruit, vegetables, pharmacy and much more. FreshCo offers you a great range of price on the flyer. 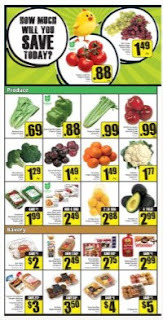 Stay Active on WeeklyFlyersCanada.com, to get noticed on new special price from FreshCo everyday. Simply Lemonade or Gold Peak Iced Tea Beverage -- Price $2.49 / 1.75L (Save $1.50) . Minute Maid, Nestea or Five Alive Juices or Drinks -- Price $2.49 10x200ml. Minute Maid Frozen Punches -- Price $0.69 Selected varieties. 295ml. Evian Water, Monster Energy Drinks -- Price $1.99 (save Up to $1.30) Evian water 1.5L, monster energy drinks 458-473ml. Powerade -- Price $3.99 (Save $1.80) 6x591ml. Refrigerated Jell-O Pudding or Gels -- Price$2.49 ( Save $0.50) Selected varieties. 4 cups. Kraft Cheez Whiz -- Price $5.99 (Save $3.00) Large 900g size. MiO, Crystal Light, Country Time, Tang or Kool-Aid Liquid Enhancer -- Price $2.99 (Save $1.00) 48ml. Maxwell House K-Cups -- Price $13.99 (Save $3.00) 30's. Classico Riserva -- Price $4.99 Save $2.00 650ml. Janes Pub Style Chicken Strips, Nuggets, Burgers, Fries or Popcorn Chicken -- Price $8.99 (Save $3.01) Frozen. 1.2kg. Janes Pub Style Fish Sticks or Tempura Battered Fish -- Price $8.99 (Save $3.01) Frozen. 1.1 kg. Lilydale Turkey Bacon, Chicken or Turkey Sausages -- Price $3.99 (Save Up to $2.00) 375g. Ensure or Glucerna Meal Replacement or Oasis Meal Replacement -- Price $9.47 (Up to Save $2.20) While quantities last. 6pk. Tylenol or Motrin -- Price $8.47 Up to Save $4.20 Selected types & sizes. Available only in stores with a pharmacy and when a pharmacist is on duty. Gatorade Sports Drink -- Price $0.99 / 950 ml. While supplies last. Iogo Original 1.5% or 0% Yogourt -- Price $3.99 (Save $2.00) 16 x 100 g.
Doritos Nacho Chips -- Price $2.49 / (Save $1.00) 230-255 g.
Humpty Dumpty Snacks -- Price $2.49 / (Save $0.50) 265-290 g.
Red Rose Tea -- Price $3.99 / (Save $4.00) 144's. Dad's Cookies, Peek Freans Cookies $1.99 -- Price $1.80 Save Dad's cookies 300-320 g peek freans cookies 265-350 g.
Buy cheap for Nestea, Fruitopia, Minute Maid or Five Alive Drinks $3.99 -- Price $2.70 Save 12 x 341 ml. Cashmere Bathroom Tissue $9.99 -- Price $5.00 Save 30 big roll. Rougemont Apple Juice -- Price $0.97 945 ml. Chef Boyardee Pasta -- Price $1.24 / 411-425 g.
Swanson Frozen Dinners -- Price $2.49 / 238-345 g.
General Mills Family Size Cheerios or Kid's Cereal -- Price $4.99 General mills family size cheerios 525-720 g or kid's cereal 580-650 g.
Bananas -- Price $0.56/lbProduct of Costa Rica or Guatemala. $1.23/kg. Redpath Granulated Sugar -- Price $1.97 / 2 kg. Sealtest Skim, 1% or 2% Milk -- Price $4.27 / 4 L bag. Excluding premium varieties.